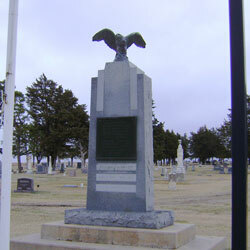 Description: The granite monument is capped with a bronze eagle with wings spread. A bronze plaque on the monument reads: "In memory of ~ the illustrious dead ~ and in honor of our ~ living heroes who ~ have defended us ~ in all our wars ~ Civil War 1861-1865 ~ Spanish War 1898 ~ World War 1917-1919 ~ Erected by our patriotic citizens ~ May 30, 1931". Beneath the plaque are additional inscription of "World War No II 1941-1945", "Korean War 1950-1953", and "Viet Nam Conflict 1964-1975". 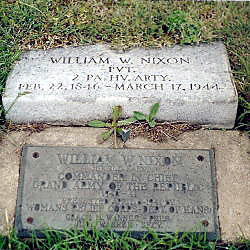 "William W. Nixon ~ Pvt ~ 2 PA HV Arty ~ Feb 22, 1846 - March 17, 1944". "William W. Nixon ~ Jewell, Kans ~ Commander In Chief ~ Grand Army Of The Republic ~ 1940-41 ~ Presented April 6 1941 By ~ Womans Relief Corps - Dept Of Kansas ~ Grace M. Wanner - Pres ~ Judy Wanner - Secy." 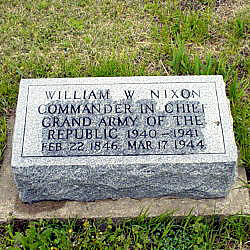 "William W. Nixon ~ Commander In Chief ~ Grand Army Of The ~ Republic 1940-1941~Feb 22 1846 - Mar 17 1944". 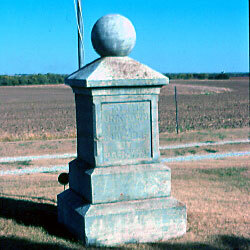 Description: A granite monument in the cemetery is engraved: "To The ~ Unknown ~ Dead ~ 1861-1865 ~ By ~ G.A.R. 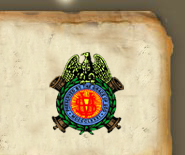 & W.R.C.". 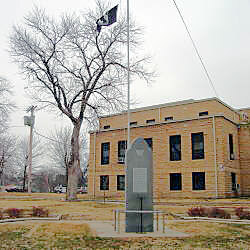 Description: A granite monument is mounted next to a flag pole. 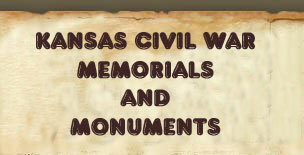 The monument is inscribed: "Dedicated To Those ~ Men And Women Of ~ Jewell County Who ~ Made The Supreme ~ Sacrifice Of Their ~ Lives And To All Who ~ Fought And Served ~ In Every Crisis Of ~ War And Peace. 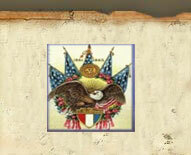 Not ~ Only For The Cause ~ Of America, But For ~ The Cause Of All ~ Mankind".